Baby giraffe born at Port Lympne Reserve in Hythe. 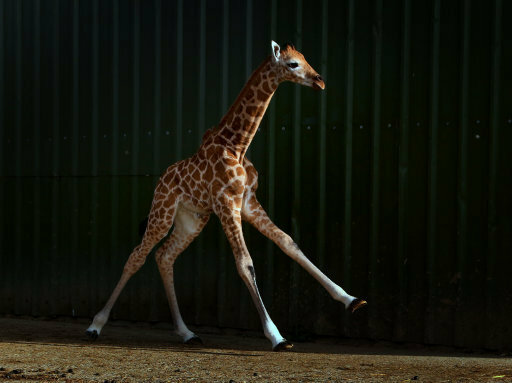 Keepers at Port Lympne Reserve in Kent said the birth of the 5ft 6in (1.7m) male to first-time mother Lehana was an ``early Christmas present''. The arrival of the unnamed calf is part of the park's contribution to a European breeding programme aimed at saving the giraffe from being wiped out. The birth comes at a critical time for the world's tallest land mammal, with the species being classed as vulnerable to extinction on the latest global Red List of Threatened Species. Animal director Adrian Harland said: ``We managed to catch the birth on CCTV cameras and, watching the footage back, we can see that soon after birth, he's already trying to stand, although he was very wobbly. The giraffe population has declined by up to 40% in the past 30 years, fuelled by habitat loss, illegal hunting and civil unrest in the African countries they inhabit.